Do we need more foreigners in Singapore? Crowded trains and the cadence of foreign accents – the increase in Singapore’s population size is hard to ignore. Especially when you recall the halycon days – when trains were empty, and Singlish was popular. Earlier in May this year, the Police Workplan Seminar held a dialogue with about 200 junior college and polytechnic students. They raised the question of whether foreigners should take up roles as police officers in Singapore. More than half of the students who attended the seminar opposed it, while fewer than ten students were for it. Based on statistics from Ministry of Manpower, the percentage of foreign workforce stands at 37.83% (as of December 2013). Do we really need more foreigners here in Singapore? Especially in sensitive services such as the Police force? Despite having a low unemployment rate, the influx of foreigners is often considered undesirable. Some perceive it as greater competition in terms of jobs or education, while others pin the fault of traffic contestion and high property prices to the increased population. With a bigger labour force, Singapore’s economy will be able to grow at a faster pace. However, Singapore is a small country with limited land and the growth in population size must keep pace. 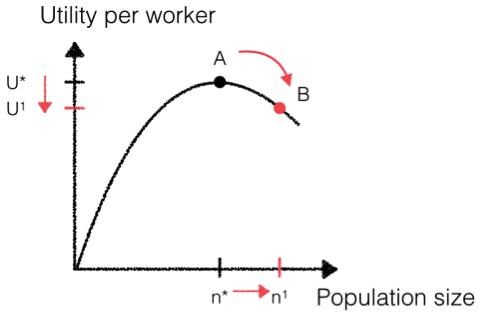 With increasing population density, there will be increasing urban economics problems such as traffic congestion – factors which reduce the utility of workers. This brings to mind the law of diminishing returns. Many workers will increase benefits in the early stages of a city, but it will fall when the population size is beyond the ideal point. Therefore, if Singapore’s population is already beyond the ideal point at A, any increase in population size will cause utility to decrease. This is why we should not increase the population size any further. Statistics show we are now having slower population growth last year of just 1.6%. The slowest in the past decade, attributed directly to tightening immigration policies. Slower population growth is a good thing today. Citizens need time to breath. However business dependence on foreign workers is strong and it is hard to ween them off it. Ageing population and baby droughts are not improving the replacement rate of the labour force in Singapore. With the total fertility rate of 1.19 in 2013, we are far from the replacement rate of 2.1. Furthermore, the increasing medical costs for the elderly would be a huge financial burden for the government. How can Singapore continue to prosper with a shrinking labour force and increasing need of elderly care services? Let me show you what problems businessmen face. 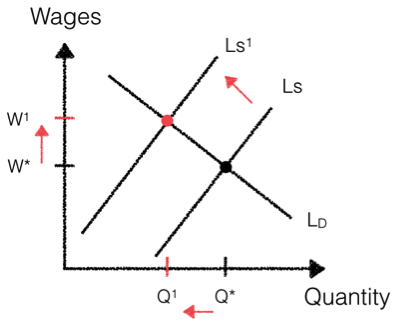 Here, you’ll see a decreasing labour supply will result in higher wages – which may seem good now, but firms will face an increase in labour costs and this drives the cost of living higher. Firms may need to look for value, either through technology or face redundancy. With higher educated and more pampered Singaporeans, we also start to see a gap in some industries which no locals are willing to fill up. Who is going to take up the jobs of the construction where working conditions are harsh and little work-life balance is promoted? We can see a declining trend in Singaporeans filling up the construction and service industry. We certainly need a larger workforce to keep Singapore going – not just to fill up the jobs that Singaporeans are not keen in taking up, but also to supplements the workforce in every aspect. If it you think it does not affect you – think about health eldercare, how many locals are willing to perform the jobs of nurses and caregivers? Now back to the question of having foreigners in the police force, should we entrust our security needs to these foreigners to protect our community? Would they have the interpersonal skills to meet people from different levels of our society to serve well in this role? It is evident that we need more police officers through the shortages of manpower in the recent Little India riots. Having foreigners in the police force could allow them to communicate to their fellow foreigners in Singapore, whereby close to one-third of our population is made up of Permanent Residents and foreigners. However we ought to do our best in recruiting Singaporeans to our best ability. We cannot continue to depend on foreigners in every industry that has declining labour supply. Yvonne Ng is an Economics undergraduate that is constantly thinking about how reality relates to theoretical models. She also finds it interesting to study human behaviour and rationalise things that people are confused with. At her free time, she enjoys travelling and good coffee. We most certainly have enough,thank you very much. It isn’t so much of me being xenophobic about foreigners(being one technically).But cause let’s all face it,how many of us are rich buggers that can afford to drive? I remembered ten years ago when i boarded my lovely MRT and felt so contented with having room to breathe in. Now,I feel worse than a fish market. Yes,our country is small. Yes,we usually travel a few stops. But yes as well, we are very complaining people.It is a mass defining trait. One day without complaining could mean the end of life itself. It’s strange as well whenever i come back after a long day that i notice the people i share the train with,as well as after when i walk back home. Probably 70-80% are foreign. In my neighbourhood, there’re mainly Indian,Chinese,Korean,Caucasian and Japanese. Sometimes i worry,that if ten years changed so much of what i once knew,then what of twenty or thirty? What of the day i lay dying in my bed?Will i belong to the smartass/smart group that chose to live life as an expatriate in some other country,only to be classified in the same debate but in a foreign website similar to this? We cannot really get ouR heads out of this mess for too many have affirmed themselves to be Singaporean. Don’t get me wrong, i love all foreign friends and neighbours. I just feel that flux. One that everyone wonders,but no solution. We should classify Singapore akin to that of Atlantis or Pompeii and hope that perhaps someday,we sink cause we’re too heavy or get hot volcanic ash from Mt. Fabre(fat hope of that one,but one can dream),to save us from all this.